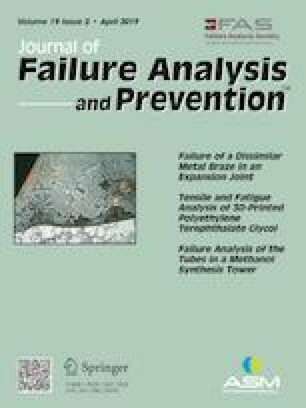 Failure of low-pressure (LP) turbine rotor blade in a low-bypass turbofan engine is analyzed to determine its root cause. Forensic and metallurgical investigations are carried out on the affected blades. High surface oxidation on damaged blade is found to be the reason for crack initiation in blades. Thermal fatigue is the probable cause of failure in the blades due to prolong operation at maximum condition and malfunction of engine control system. The authors are very grateful to the Chief Executive (Airworthiness), CEMILAC, for his kind permission for publishing this paper. The authors are also very thankful to the engineers of Hindustan Aeronautics Limited and Aeronautical Quality Assurance for their support and help during this investigation.